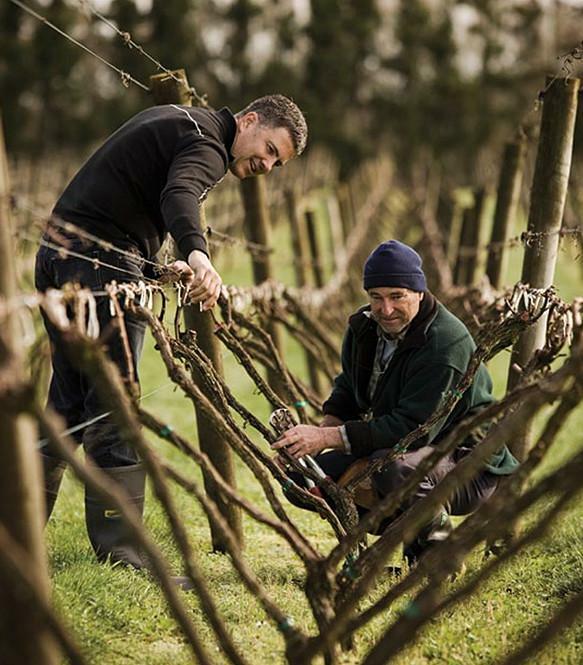 The story of Kumeu River Wines unfolds more than a half-century ago when the first generation of the Brajkovich family arrived in New Zealand. In 1938, Maté Brajkovich emigrated with his mother, Katé, and two sisters, Frances and Nevenka, from Dalmatia in southwestern Croatia to New Zealand. His father, Mick, had already been there for a year, working in the northern Kauri gum fields. After three years of public education during which time he learned English, Maté left school and joined his father digging Kauri gum. Two years later, the family moved to a dairy farm, then to Henderson in West Auckland where they worked in the orchards and vineyards. By 1944, they had saved enough money to purchase land in Kumeu. Although there was a small vineyard already in production on their new property, the main activity was mixed farming; so for the first few years, Mick, Katé and Maté grew fruits and vegetables and raised dairy cows. In Dalmatia, many families made wine for their own use from their own vines; it seemed only natural to do the same in New Zealand. The land was so well-suited for wine grapes that wine production in Kumeu far exceeded home consumption, and the Brajkovichs started making wine commercially. Although Mick died in 1949, Maté and Katé continued to run the family business which became known as San Marino Vineyards. They produced dry red table wine in the style that was preferred for everyday drinking back in Europe, which soon gained popularity among the literary and university circles of Auckland. In 1957, Maté met his wife, Melba Sutich, whose grandparents had also immigrated to New Zealand from Croatia. Maté and Melba were married in 1958, and as the vineyard and winery expanded, so did the family. Michael was born in 1960, followed by Marijana in 1961, Milan in 1963 and Paul in 1967. For the children, being brought up around the winery established a strong foundation of industry knowledge and skill that would take the winery to a new level of success in years to come. 1979 was a watershed year for Kumeu River, when the Brajkovichs moved away from hybrid varieties used for the production of fortified and basic red and white wines to the now-common -- but then-unusual -- varieties such as Chardonnay, Sauvignon Blanc, Pinot Noir and Merlot. As Michael, Milan and Paul became more involved in the family business in the 1980s, the Brajkovichs continued to focus on quality and reputation; the winery changed its name to Kumeu River Wines in 1986 and began making a Burgundy-influenced style of Chardonnay that featured indigenous yeasts, extended lees aging and malolactic fermentation. The result has been a series of wines that are innovative, distinctive and unique in both style and quality for New Zealand. Today, Kumeu River produces 250,000 bottles annually from 30 hectares (74 acres) of estate vineyards in Kumeu, and another 10 hectares (24.7 acres) from local growers.